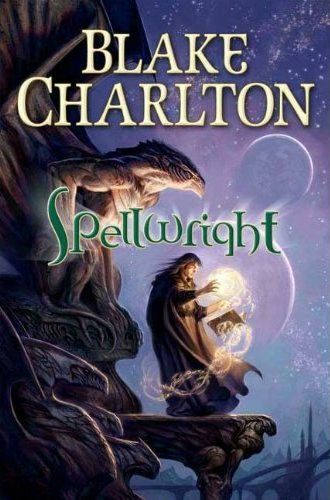 I just finished reading the debut novel, Spellwright by Blake Charlton and I'm taking a moment to review it. I never do, but this time I WILL. As Patrick Hester said on the Functional Nerds, "Reviewing a book is hard." And whether he meant it or not is debatable, but I know that it takes time that could otherwise go to something else. So in that fashion, I will agree. As a first novel it is a solid home run. The prose starts strong, with great characterization and flow. The plot unveils at a good pace and there is some great intrigue between competing factions (in which I would have liked to see more). The magic, as you have no doubt already heard, is different and interesting. As the novel progresses, the magical languages broaden a bit much for my taste, in a way cheapening what came earlier. I think more focus on a few would have been a stronger choice. If I was to draw a line-chart for the quality of the story as it progressed, I would start high for almost half of the book before a dip which continues till about two-thirds with intermittent turbulence. Then there are some extreme dives, turbo boosts--through what could have been interesting parts of the story--then a sharp rise back up to finish at a decent ascent. I should note that a new author is often inconsistent in their story telling. It takes quite a while--as you can imagine--to master your prose, story and characters. So, with that in mind, he does an outstanding job. As examples: Sanderson's first attempt, Feist's, Eddings', Farland's, and probably many more all had the same issue (more or less). I know of few, like Rowling, that manage to maintain consistency throughout. It's all about practice, as is everything in life. Even a master like Jordan was hit with much criticism as his epic The Wheel of Time became mired within itself about half way through the series. Overall, I give it high marks as a first endeavor by a very busy man and will be checking out the upcoming sequel Spellbound. Blake Charlton, if you don't know, is also a medical student and hopefully one day he will extemporize a cure for cancer with Language Prime fluency (don't know what I mean? Read the book). He's an interesting, easy to talk to fellow and you can follow him on twitter if you are so inclined. I could talk more about the book, but I have to get back to my own writing. What did you think? Writing book reviews is hard. feel free to quote me- oh, already did. FINE! GAWD! Book good so far. Not finished yet. Other distractions mounting. May never finish at rate I'm going. I hear ya, thought I'd never finish the last bit. I hit the big reveal last week some time, and could only get through little bits and pieces at a time. Really dragged it out, but you use what time you have.